I have been wanting to do a Sensationalist post on horror games for some time now. This stems from a morbid fascination with the genre. I do not actually like being scared by my entertainment. I disavow horror films along with roller coasters and baby showers as too frightening. Fear is my mind telling me leave this situation immediately; I usually listen. But I occasionally turn back to horror games, as if I were checking the closet to see if the ghost I saw earlier has vanished. Nope, it's still there. In this sensationalist, I approach only one aspect of horror games: sound effects. I have played most, but not all, of these games. There are some games I omit accidentally, others intentionally; Ghosts and Goblins and Sweet Home are early games with horror themes, but they're digital sound effects pale in comparison to later contributions. Let me know in the comments if there are terrifying sounds you remember in particular, or other auditory trends in scary videogames which you find interesting. Fear is universal. We all have a primal instinct that causes us to tremble at the sound of large animal's roar or jolt at something unexpected popping out from under the kitchen table. We also tend to fear some similar things, regardless of cultural upbringing or geographical location. For example, you would be hard pressed to find a group of children unafraid of the dark. Be they widespread objects of fear or specific to the medium, we find trends in the sound of horror games as well. Creaking wood is a horror genre staple, from the original Alone In The Dark to the latest iteration of the same game. It has become so expected it is no longer unsettling. Yet other auditory elements retain their creepy nature despite repetition. Some games, however, break the mold and find new ways to scare players. An early entry to the 'make-people-piss-themselves-in-fear' category of games is Ken Levine's System Shock 2. Taking place on a isolated and monster filled space ship (itself a horror trope? ), the player is treated to the same sounds that appear in numerous horror titles. A persistent electric hum permeates the ship, punctuated by monstrous groans and the calm, digitally distorted voice of SHODAN, the evil AI. The mechanical surroundings create an eerie contrast with organic enemies while playing off a fear of powerlessness in the face of human made constructs. The mixed sounds that come with a ship or other metal environment create an excellent atmosphere for horror games. 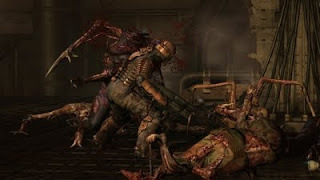 The electronic hum and sound of steam in Doom 3 and Prey make a hostile and confining environment. Similar sounds in Bioshock make rapture a frightening prison that seems alive itself. Dead Space follows suit, but blends in the popping, gurgling, sticky, meaty sounds of organic creatures and environments to contrast with the ship. In this case, contradictory sounds foment fear by revealing the fragility of a man made object in the face of animalistic horrors. Contradictory sounds appearing in unexpected environments evokes disturbing sensations. The laughter of children, joyous on the playground, becomes petrifying in a dark abandoned warehouse. Alma, the nightmarish child of the F.E.A.R. franchise, is the most macabre addition to a not-quite-traditional shooter. The Fatal Frame series is another terrifying series (See video to listen to players screaming in fear). Putting aside the fact players are only armed with a camera, the sounds of ghost laughter mixed with screams is incredibly unsettling. Familiar sounds in unfamiliar environments evoke the fear of terrible things invading the safety of day-to-day reality. If laughter is not a sign of joy and safety, then nothing is. These unexpected sounds are often disembodied, permeating the environment. Even Max Payne, not a horror game at all, has a very disturbing nightmare scene in which the protagonist is haunted by moans, a crying baby, and the sounds of his troubled wife. Siren, a very creepy stealth-based game, scares with the disembodied sounds of enemies (or the titular siren). One enemies laughter is particularly disturbing as he hunts you down. Most of the games mentioned thus far do the same, with the sounds of enemies reaching you before you can see them. The singular sounds of approaching enemies is most affecting in silent environments. What more iconic game imbues its world with silence than Silent Hill? The second entry to the franchise is the most frightening game I have ever played. The fogged drenched town hides unknown numbers of shambling abominations. These creatures cause the player's radio to buzz with static when near but still not visible. The knowledge that an unseen enemy approaches is more frightening than actually seeing it. Until it comes into range, the player is powerless. Silence isolates sound, giving it weight. Like the creak of wood, the sound of footsteps in an otherwise quiet game becomes unsettling. Eternal Darkness and Parasite Eve are two relatively quiet games whose repetitive foot steps (or clanking armor) map the players solitude, which is almost as frightening as being alone with something else. The sound of Pyramid Head's blade scraping the floor as he stalks the protagonist of Silent Hill 2 is more unsettling with the quiet backdrop. Most of the aforementioned games have long moments of silence. The most terrifying sounds in most of these games are solitary and descriptive. Silence, or the repetition of foot steps or a living environment, acts like sonar, alerting you to the sounds of other distinct noises. These solitary sounds evoke a sense of horror because they represent the intangible. With good sound design, an empty mansion can feel populated with a legion of terrible constructs. Players cannot fight against sounds, they cannot enact agency upon the incorporeal. In a medium which imbues players with power, the sound of helplessness is terrifying. I think what makes sound a more powerful tactic in a horror game than visual, it the nature of it. Unlike the visuals of a game, the sound is right in the room with you. Despite the fact that they were produces by complex audio algorythms they are real, while what you are seeing is not. It also part of the reason, well laced rumble fuctionality is also terrifying. The tactile sensation of something vibrating in your hand is real, just like the sound. It is in the room with you. I agree with the "in the room with you" feel of sounds. In that same branch, your agency is limited to the screen. Maybe there is a subliminal panic of helplessness. I agree that it is the audio that raises a game from mildly scary to truly frightening. Silent Hill 2 is also the most terrifying game I have ever played. If more game even tried to approach Silent Hill 2, perhaps the genre wouldn't be so muddled. The scariest parts of the Silent Hill games were often those parts where there was absolutely no music whatsoever, but still some ambient noise. Keeping with Silent Hill, one example that stood out for me was the 4th game, The Room. Hands down the scariest game I've played, mostly for the blend of difficulty and horror elements. But the example come from a piece of music you hear in the pre-title screen sequence. Like the other games you get a type of 'trailer' intro, The Room's intro is far more reliant on jump cuts and loud and aggressive sounds than the other games, but at the end you are treated to a somewhat calming melody, sounding like a group of people humming with a subtle organ sound in the background. I always saw this as 'nice' music and even listened to it a lot outside of the game. Then it shows up during gameplay, in the final stages and while all I was doing was wandering some hallways with rust and 'meat' on the walls and not fighting any monsters, I honestly felt sick to my stomach. What was once to me calm music was now something that filed me with pure fear. I've never felt this way in a game before and since then. I love that the scariest game most people have played is in the Silent Hill franchise. Again, Silent Hill have mastered uncomfortable sounds and relative silence. It's impressive when a game can make you uncomfortable to the point of nausea. Though next time, you might want to only play during the day with the sound off.